Yesterday the Office for National Statistics (ONS) published its annual rundown of what UK households spend their money on. Quite a bit of the ONS’s analysis focused on who spends most on takeaways. 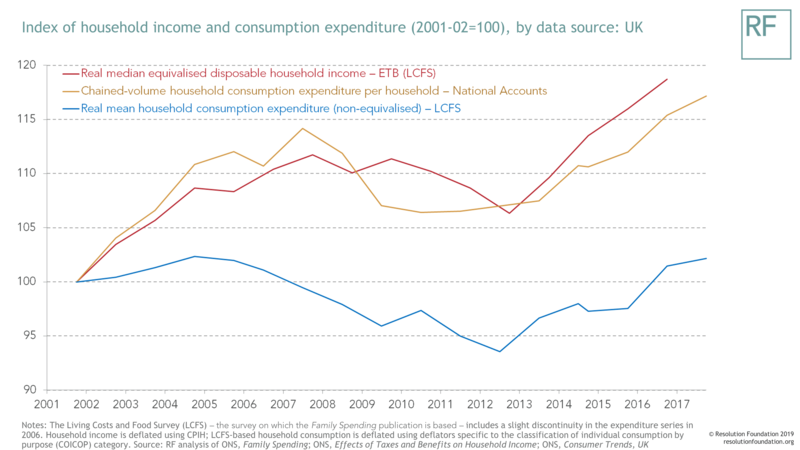 But given household consumption is perhaps the most detailed and direct window on current living standards, there’s plenty more of interest in this treasure trove of information. Here are our five key takeaways (of the non-edible kind). Average weekly household spending was £573 during 2017-18, a gentle 0.7 per cent increase on the previous year (after adjusting for inflation). As the blue line in the chart below shows, this means we’ve had five years of almost-continuous growth in real spending – a trend mirrored in household income data, and consumption aggregates from the National Accounts. While things appear to be moving in the same direction, we should exercise caution when interpreting these trends. 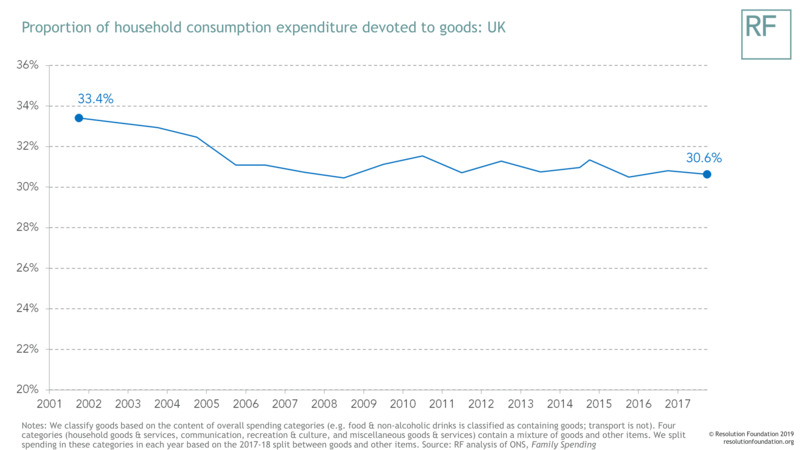 That’s because – as the chart also shows – a big gap opened up between expenditure measures in the 2000s, due to growing under-reporting of spending by respondents to the Living Costs and Food Survey (see Box 1 here for more details). This means that survey-based estimates of overall consumption changes over time (and their relationship to income changes) should be interpreted with a high degree of caution. It will come as no surprise that richer households spend more than poorer ones. 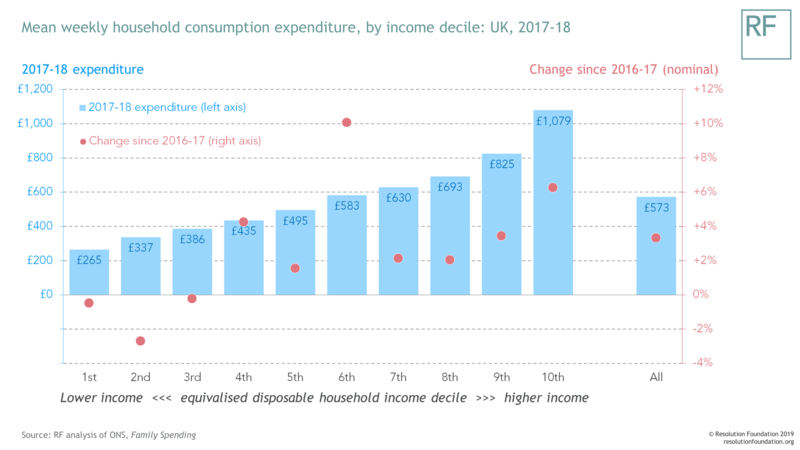 The chart below shows that in 2017-18 those in the top 10 per cent of incomes spent over four times more than the bottom 10 per cent. Although large, this gap is smaller than the income differences between the top and bottom – further proof that the rich save more of the money they have coming in. Higher-income households also experienced faster growth in spending than lower-income ones in the year to 2017-18. Nominal spending growth averaged 0.5 per cent in the bottom half of the income distribution, compared to 4.8 per cent in the top half. This pattern stands in contrast to the progressivity of spending increases evident last year. While the data is noisy, these figures might provide clues as to the distribution of income changes in 2018, something we’ll be exploring in our annual Living Standards Outlook next month. Beyond the overall value of spending, what are households spending money on? 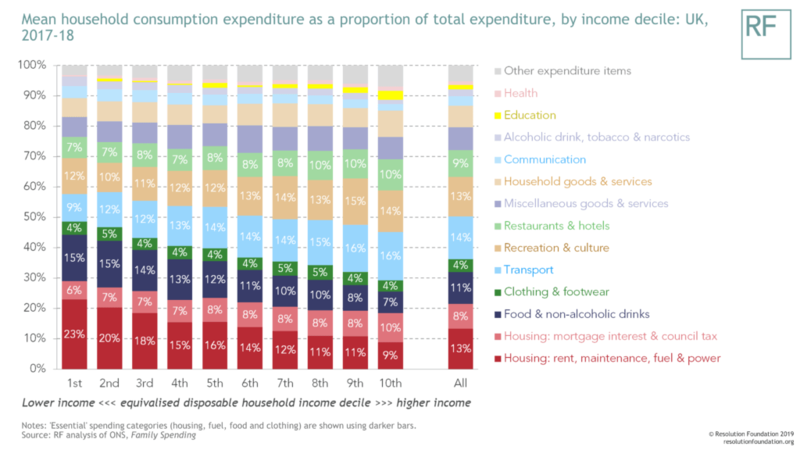 The chart below splits average spending in each income decile into different categories, with darker bars showing those categories commonly classed as ‘essentials’ (housing, fuel, food and clothing). 49 per cent of spending in the bottom income decile was devoted to essentials in 2017-18, compared to 29 per cent in the top decile. Household spending varies across the life cycle and peaks when adults are in their 30s and 40s, in a large part because these households tend to be larger due to bringing up children. To correct for this, the chart below presents spending on a per-person basis, showing that on this measure it is households headed by those aged 50-75 that spend most overall. It’s not just the level of spending that varies over the life cycle though, what we spend our money on changes. 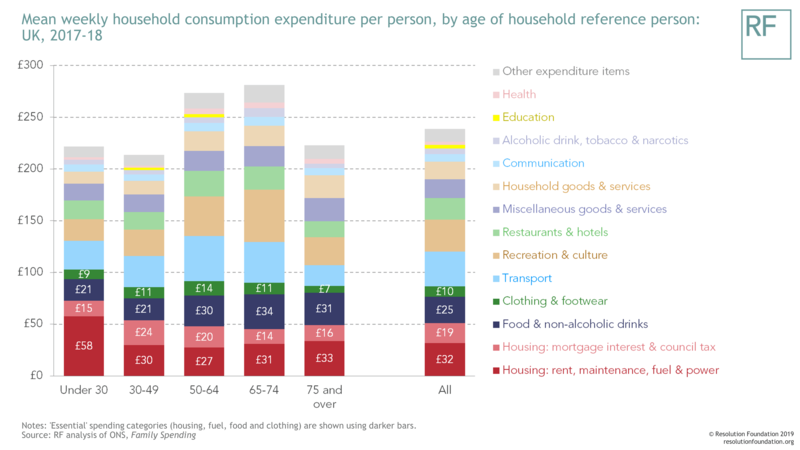 The youngest households spend most (45 per cent of all spending) on essentials, while those in early retirement devote the largest share of spending to recreation and culture (which includes package holidays). Previous Resolution Foundation analysis of generational consumption patterns showed that this is an emerging phenomenon: despite the stereotype of millennials as avocado-toast-eating jet-setters, recent growth in holidaying and eating food in cafés and restaurants has been driven solely by older households. The rich detail provided by spending data means it can be illuminating to wider debates about how life and work in Britain are changing. Perhaps wishing to keep up with the current focus on Deliveroo-type jobs, the ONS’s publication shines a light on the £5.10 per week UK households spend on takeaways, which make up a greater share of ‘catering services’ spending for the young and those on lower incomes. It also shows that we spend less on alcohol than we did a decade ago and do more of our drinking at home. This chimes with the ONS’s earlier work on the decline of small pubs, as consumers increasingly favour larger ones that focus on gastro menus rather than actual booze. Another prominent economic debate concerns the troubles of the British retail sector and the decline of retail jobs. To see how this might be reflected in household spending, the chart below splits spending into the consumption of ‘goods’ that you might buy in shops, and everything else (services, experiences, housing, etc). Echoing official retail sales figures, we see only a small decline in the share of spending that is associated with goods purchases. The different stories told by retail spending data and high-profile shop closures might reflect the fact that we’re not buying less stuff, we’re just increasingly doing it online. We’ll be exploring this and other topics touched on in yesterday’s treasure trove of spending data in more detail in coming months.